Close-up of a polymer film on a glass substrate before immersion in a polyoxometalte solution to electrically dope the film over a limited depth. Credit- Christopher Moore, Georgia Tech. Scientists from the Georgia Institute of Technology, along with colleagues from the US, Japan and The Netherlands, have demonstrated how to induce p-type electrical doping in organic semiconductor films, enabling the development of efficient single-layer solar cells. The simple process, which uses the quick immersion of the films into a solution at room temperature, could offer a cheaper alternative to the molybdenum oxide layers used in most polymer solar cells and organic electronic devices, which tend to be processed with expensive vacuum equipment. 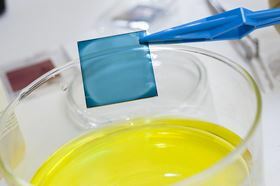 As it simplifies the process for fabricating polymer-based solar cells, as described in Nature Materials [Kolesov et al. Nat. Mater. (2016) DOI: 10.1038/nmat4818], the approach could lead to organic photovoltaics being used more in new wearable devices and in small-scale distributed power generation, and could be applied in other device platforms such as in sensors, photodetectors and light-emitting diodes. As researcher Felipe Larrain claims, “Our goal is to further simplify the fabrication of organic solar cells to the point at which every material required to fabricate them may be included in a single kit that is offered to the public”. The team immersed thin films of organic semiconductors and their blends in polyoxometalate (PMA) solutions in nitromethane in situ for only a few minutes. The diffusion of the dopant molecules into the films brings about efficient p-type electrical doping over a limited depth of 10 to 20 nanometers from the surface of the film. The p-doped regions demonstrate greater electrical conductivity and high work function, as well as reduced solubility in the processing solvent and more effective photo-oxidation stability in air. Single-layer polymer solar cells were also demonstrated by combining the method with spontaneous vertical phase separation of amine-containing polymers, bringing efficient electron collection at the opposing electrode. The geometry of such devices has never been achieved before since the functions of hole and electron collection are structured in the light-absorbing active layer, providing the simplest single-layer geometry with few interfaces. For thicker films, the PMA did not penetrate into the entire film but to a limited depth of the order of a few tens of nanometers. Such limited doping depth was key to the new organic solar cell concept in which the function of collecting holes produced in the active layer could be built into the active layer itself without an independent layer adjacent to the light-absorbing layer. As Bernard Kippelen told Materials Today, “we expect this technique to become a game-changer and to be widely used by the community as a replacement of MoOx layers”. Further investigation is necessary into the stability of the doping process as well as to assess the commercial potential of transforming organic photovoltaics in this way, with efforts focused on better understanding the polymer thermodynamics underlying the penetration of the dopant molecule into the film over a limited depth. Using a roll-to-roll processing method, researchers have produced polymer-based solar cells with a conversion efficiency of more than 9.5%.